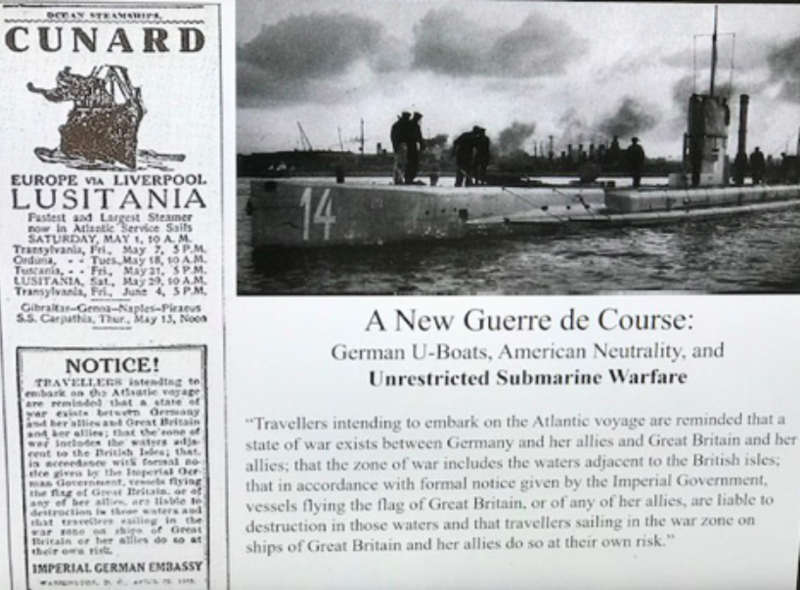 Alex Palmieri and Lynandro Simmons, journalism students at Southern Connecticut State University, reported this story as part of Journalism Capstone coursework on World War I.
Twenty Connecticut residents were aboard the British passenger ship Lusitania when German submarines sank it in May 1915. Three of them died. The Connecticut victims were among 1,198 who died that day, according to the May 9, 2015 Hartford Courant article, “Remembering Lusitania a Century Later,” by Erik Hessleberg. The sinking of the Lusitania was a factor in the United States later joining World War I. The sinking of a civilian ship changed many civilians’ attitude towards the war. 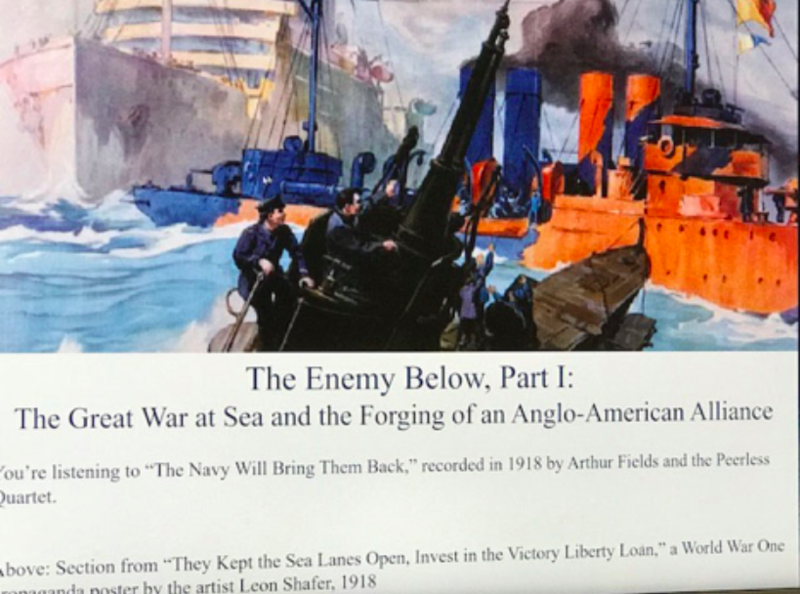 “The Lusitania was really the first major non-military ship that was sunk by the Germans during the war,” said Kevin Daly, a Monroe historian who studies World War I. Two Connecticut passengers played a significant role in rescue efforts, according to the Hartford Courant article. Elizabeth Duckworth, a weaver from Taftville, aided in the rescue of around 40 passengers. James “Jay” Ham Brooks, a salesman with a Bridgeport manufacturing company, assisted in saving 33 people. Theodate Pope of Farmington, jumped into the water when the ship was hit, according to rmslusitania.info, a site dedicated to the history surrounding the Lusitania. When Pope was rescued from the water by the crew she was believed to be dead. However, a fellow passenger named Belle Naish refused to believe Pope had passed. Naish would convince the crew to not give up on Pope and several hours later Pope regained consciousness. According to a May 7, 1915 Bridgeport Evening Farmer article, five of the passengers were from Bridgeport. Jason Smith, an assistant professor of history at Southern who studies maritime history, said the Lusitania was a majestic transatlantic ocean liner, a luxury form of transportation. “It was a status to be in first-class onboard the Lusitania on a voyage from New York to Great Britain,” said Smith. But because of the on-going war in Europe, passengers were aware of the danger of traveling across the Atlantic. Propaganda posters at the time showed unrestricted submarine warfare, in particular by the Germans, Smith said. Before the attack on the Lusitania, the Germans even issued a notice in New York newspapers, warning passengers to stay off of the ship. The sinking was a factor in the United States getting involved in the war. Woodrow Wilson, the president of the United States at the time, was considered to be an isolationist. Daly said as far as Wilson was concerned, America didn’t want to get involved in other people’s problems on the other side of the world. America could insulate itself from all of the problems in Europe when the war first started, Daly said. After the sinking of the Lusitania, Wilson faced increased pressure to enter World War I. The war effort highly impacted Connecticut, an important state for military manufacturing and support. “Even during the [American] Revolution, Connecticut had this reputation as being known as the provisions state,” said Daly. The manufacturing plants centered around the state’s rivers and waterways. “Anything you were doing in regards to building guns, Connecticut was providing for that cause,” Daly said.